This post has 423 views. The Spring 2009 anime season is now officially over, and as usual I’m trying to churn out reviews for series that watched but didn’t blog episodically. Unfortunately, progress is a bit slow these days because I have to study for other things and I inhaled too much lead fumes from soldering at work. If the writing in this review is worse than usual, you can thank the lead fumes for that. Anyways, today’s review is for Sengoku Basara, a wild, action-packed series based on a video game. Based on a hack-and-slash video game of the same name, Sengoku Basara is set in the Warring States Period of Japan and features many famous figures from that period. Among the warring armies, the wicked forces led by the Devil King Oda Nobunaga emerge as one of the predominant powers. As Nobunaga’s forces threaten to engulf Japan in a period of darkness, it’s up to the other famous warlords of the time to put aside their differences and work together to defeat Nobunaga. Animated by Production I. G, Sengoku Basara‘s primary strength is its production quality. The animation is crisp, fluid, and nicely colored, and the action is fast, explosive, and over-the-top just as one would expect from a hack-and-slash video game. Most of the “hero” class characters are basically weapons of mass destruction, and the series featured fights with massive explosions and hundreds of grunt soldiers being thrown left and right. Any trace of realism had been thrown out the window starting from the first episode, but there’s no denying that the action is visually impressive and fun to watch. The music of Sengoku Basara is also of high quality and syncs up well with the animation. 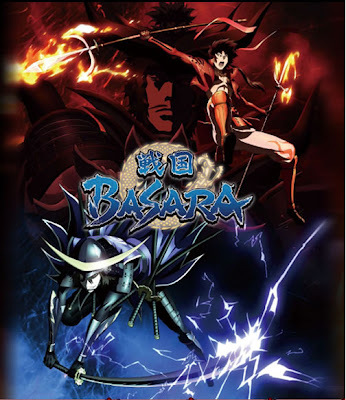 Judging by just production quality, Sengoku Basara is easily among the top anime series in the Spring 2009 season. While the production quality was impressive, Sengoku Basara had plenty of weaknesses. The most obvious one is the lack of a meaningful plot, a weakness that is common in video game adaptations. Like many other action video game adaptations, the primary and perhaps only purpose of the story in Sengoku Basara was to shoestring a bunch of battles together. As mentioned before, the action is very entertaining, but in the lulls between the battles Sengoku Basara is not nearly as fulfilling. Sengoku Basara tries to fill in part of the gaps with comedy in the form a several running jokes such as Yukimura and Shingen yelling and punching each other or Kasuga’s reaction to Kenshin’s touch. The gags were initially funny, but they get old after a couple of episodes and they weren’t always present. While Sengoku Basara didn’t take itself seriously most of the time, there were a few scenes where the show its hand at some serious tactical planning and drama and they didn’t fit in with the rest of the series. The lack of a meaningful plot is accompanied by the lack of character development. Every single character in Sengoku Basara is static: none of the characters undergoes any meaningful growth during the series, and the versions at the end of the series are exactly the same as the versions at the beginning. Date Masamune is still the same Engrish-talking, tail-pipe-handle-bar-horse-riding rogue, amd Yukimura is still the same excessively loyal and overly eager servant of Shingen. Nobody learned a single lesson from what happened during the series, and I find that both disappointing and funny in sad kind of way. Sengoku Basara is what I would consider to be a good adaptation of a hack-and-slash video game. Because Sengoku Basara was a video game adaptation, I didn’t approach the show with any high expectation regarding the stor, and that’s probably the primary reason why I was able to enjoy the show. Yeah, there’s no real plot or character development, but that action is great, and comedy isn’t bad. It’s definitely the most visually impressive anime I watched last season, and I liked how I didn’t need to know a thing about Japanese history or the video game to enjoy the series. Sometimes I feel like watching shows that doesn’t require any brainpower, and Sengoku Basara was one of those shows. The series doesn’t won’t give you any meaningful impressions or an accurate history lesson, but it’s a good watch when you are bored and want to see some over-the-top samurai action. I’ll probably catch the second season when it comes out early next year, but probably won’t be blogging it either. Nouhime deserved a much better death than to be killed by Oichi’s unholy body odor. Should have at least let Kasuga kill Nouhime in a battle. Oichi is the most pointless character in the show, having done nothing until the last episode when she was unconscious. However by that sheer fluke kill on Nouhime, Oichi is still infinitely more useful than Marina Ismail (aka the Ultimate Freeloader) from Gundam 00. Instead of finding a horse and putting handle bars and tailpipes on it, I’m thinking about finding a bike and putting on a fake horse’s head and tail. Should definitely make me the cool kid on the block. On the topic of lack of character growth, there’s no better example to illustrate the example than the end of the series, where after working together to defeat Nobunaga, all the good guys decide to abandon their friendship and go back to beating the crap out of each other. Talk about not learning your lessons. ARE YOU READY, GUYS!? LET’S PARTY!! !